Amerli in 'urgent need of help' Jump to media player The northern Iraqi town of Amerli is in urgent need of assistance to provide aid and prevent a possible massacre by Islamic State, the UN has warned. UN call to 'prevent Iraq massacre' Jump to media player The UN has called for action to prevent what it says may be a possible massacre in the northern Iraqi town of Amerli. Iraq mosque attack kills dozens Jump to media player A suspected Shia militiamen has attacked a Sunni mosque in Iraq's Diyala province killing around 70 people. Beseiged Iraqi children lacking food Jump to media player A resident of Amerli, 170km north of Baghdad, describes conditions in the town, which has been under siege by Islamic State militants for more than two months. What is a caliphate? In 90 seconds Jump to media player What is a caliphate? BBC News explains - in 90 seconds. The northern Iraqi town of Amerli is in urgent need of assistance to provide aid and prevent a possible massacre by Islamic State (IS), the UN has warned. 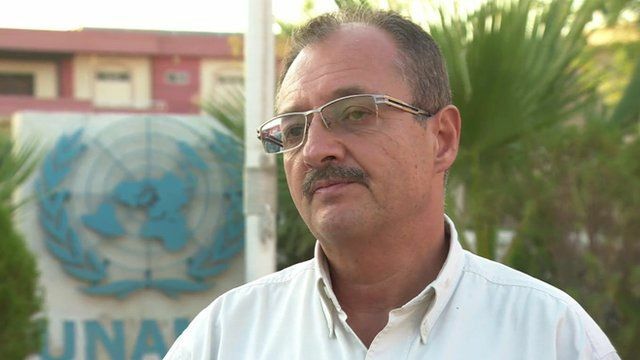 United Nations deputy special representative for Iraq Gyorgy Busztin told the BBC's Jim Muir that some 15,000 people were trapped under siege by IS forces. The IS campaign has displaced an estimated 1.2 million people in Iraq, many of them minority Christians and Yazidis.